Bowdoin College head football coach J.B. Wells addresses the Polar Bears during a game in 2015. Bowdoin opens its 125th gridiron season on Saturday with a NESCAC contest at Middlebury. BRUNSWICK, Maine – The Bowdoin College football team will open its 125th season on Saturday when they travel to Vermont to battle Middlebury College. 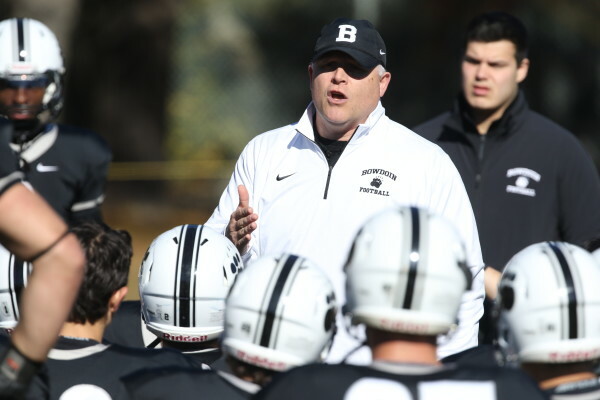 The Polar Bears are entering their second season under head coach JB Wells, who steered the team to a 2-6 record in his first year at Bowdoin, tied for sixth in the NESCAC. Middlebury finished the 2015 season with a 5-3 record in a tie for fourth place. The contest will be the first meeting between the schools since 2013. Fans can follow all of the action live on Saturday on the Bowdoin Athletics website ( www.goubears.com). Live stats will be available on mobile devices and the Northeast Sports Network ( www.nsnsports.net) will broadcast the game live from Youngman Field in Middlebury. Offensively, Bowdoin returns its top passers, rusher and two of its top three receivers from a year ago. Senior Tim Drakeley (954 yards, 6 TD) and sophomore Noah Nelson (966 yards, 7 TD) split time at quarterback last fall and posted nearly identical numbers. Receiver Nick Vailas finished second in the NESCAC in receptions (48) and fourth in yards (583) while All-Conference performer Bryan Porter led all NESCAC tight ends in receptions (36) and yards (425). Bowdoin ranked second to only Middlebury in the NESCAC in passing offense last fall. Defensively, Bowdoin will rely on a veteran defensive backfield that features four returning starters, including seniors Jibrail Coy (43 tackles, 2 INT in 2015) and Reeder Wells (48 tackles, 1 INT in 2015). The Polar Bears ranked in the middle of the league in passing defense last fall, but will look to improve on their rushing defense, which stood last in the league, allowing 200.0 yards/contest. A revamped front-seven will feature junior LB Latif Armiyaw, who posted 44 tackles, 3.0 sacks and 5.5 tackles for loss last season. Consistently one of the most potent offensive teams in the NESCAC each year, Middlebury led the NESCAC at 409.1 yards per game last season, including 335.1 through the air. The Panthers will look to replace the conference’s Offensive Player of the Year quarterback Matt Milano, who graduated last spring, with junior Jared Lebowitz. Tailback Diego Meritus returns for Middlebury after ranking fifth in the NESCAC at 57.9 yards rushing per game in 2015. Defensively, the Panthers lost their starting defensive line and leading tackler, but will look to senior Addison Pierce (58 tackles, 7 TFL) who finished tied for the team lead in tackles a year ago. Due to the NESCAC’s rotating schedule, Bowdoin and Middlebury last met on September 21, 2013 at Whittier Field in Brunswick. The Panthers came away with a 27-5 victory in a game that was interrupted due to a massive power outage in the Mid-coast region. Middlebury scored twice in the second quarter to build a 21-5 lead and added a lone touchdown in the second half to seal the victory. Bowdoin has played Middlebury just 21 times in the series history- the fewest of any of the Polar Bears’ NESCAC foes. The squads first played in 1916 (a 7-0 Bowdoin victory) and did not play again until 1976. The Panthers, who hold an 13-7-1 edge in the all-time series, have claimed the last six meetings between the teams in Vermont. Bowdoin’s last victory in Middlebury came in 1991 – a 27-22 win.